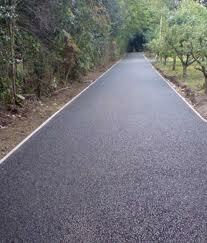 Tarmac and asphalt are among the most commonly-used products for surfacing applications. This is due to the many benefits they offer; they are tough, durable and provide an attractive visual aesthetic whether used in the domestic or industrial sector. Over time, these qualities can become diminished but can be given a new lease of life with Tarmac and Asphalt Restorer from Greengate's, your local builders merchant. Often, the first thing that is noticed when tarmac starts to deteriorate is the aesthetic element. Usually black or red, this colour can quickly fade, signifying a reduction is physical quality. The best way to restore this colour, along with the physical quality, is Tarmac and Asphalt Restorer, which reinforces the surface and restores original colour. The product works by binding aggregate in place, holding it properly together and giving it the extra strength required to deal with constant usage. Wherever it is used, Tarmac and Asphalt restorer lengthens the service life of the substrate. As a single component, it is very easy to install and dries very quickly, allowing the surface to be used again without unnecessary delay. It is not only usage that damages tarmac and asphalt surfaces: UV radiation can cause deterioration as well. Tarmac and Asphalt restorer has an integral anti UV shield, preventing further damage and maintaining fresh colour while protecting against future staining. Find out more details on the website and try our Black or Red Tarmac and Asphalt Restorer today!